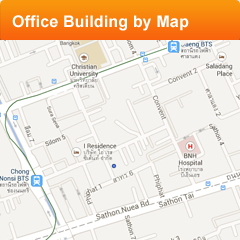 Helping you find your new office space in Bangkok. What sets us apart from the majority of the commercial real estate agencies here in Bangkok is the fact that Rent Office Bangkok is a truly independent property agency, carrying out tenant representation only, which means that our commercial property advisers exclusively work for office seekers, occupiers and tenants. Therefore we do not undertake property management for the owners of office buildings. Our competition on the other hand, primarily acts on behalf of commercial property owners by managing the office buildings for the owners and executing juristic person’s duties regarding landlords’ premises, while at the same time “advising” current and potential occupiers. Our Bangkok office leasing experts work closely together with your management team on the optimal office space strategy, in order to find the best office space for the operational needs of your organization. During this cooperative process we provide your team with essential resources on the Bangkok office market, the relevant commercial locations, the applicable office buildings with their facilities, and every available office space, on as well as off the market. Once your criteria for the ideal office have been defined and prioritized, Rent Office Bangkok selects from the preferred office locations in Bangkok, its best matching office buildings with the most suitable office spaces. Subsequently our Bangkok office space agents will arrange site searches at the office buildings of your interest. Once the right office space has been targeted, our Bangkok office leasing negotiator can start working on achieving the best solution for your ideal office space strategy. Having access to all of the office buildings in Bangkok and being constantly involved in commercial property transactions, lease renewals and lease restructuring, we have developed a distinct knowledge of the numerous leasing conditions at any moment in the local office market and have established a strong position in negotiating with the owners of the Bangkok office buildings, which qualities enableRent Office Bangkok to achieve the lowest rental prices, the best possible package of costs, the most favorable leasing terms and the best protection for our clients. Securing the right conditions to match your ideal office space strategy has a continuous and profound effect on your organization. All these negotiations are completely transparent, as our Bangkok office leasing team works closely together with your management during this process. Acting only in your interest, is where our successful working relationship evolves into a long-term partnership between your organization and Rent Office Bangkok.